Cap Connections offers truck accessories in-store at our Waukesha location, and if it’s not in our showroom then we’ll order your custom accessory for you. It doesn’t end there: our trained staff has the years of experience to properly install any truck accessory whether you bought it from us or not—and they’ll do it right the first time. The only thing worse than paying for a new truck cap because yours was damaged, is not being able to afford a new one at all. Ditch the stress and come to Cap Connection in Waukesha to repair your aluminum or fiberglass truck caps—let our professionals take a look, diagnose the problem, and come up with a cost-effective solution to keep your truck running happy. And if the job is just too costly for a repair, our experts will show you affordable replacement options you can trust. 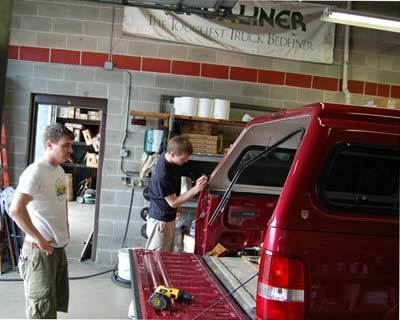 Cap Connection has been in the truck accessory business servicing the Waukesha area for over three decades—trust us to take care of your truck accessory installation or repair needs. Contact the Waukesha truck accessory service center to order parts or for more information on our services.